For years, we’ve known what the Brooklyn Nets were doing. General manager Billy King has basically attempted to latch on the biggest names available, no matter the basketball price, the actual payroll figure, or potential fit with his incumbent roster. Boston’s most recent motives were also clear. We knew the Boston Celtics were rebuilding. We just have no clue why they’re going about it this way. As was first reported and then broken by Yahoo! Sports’ Adrian Wojnarowski, the Boston Celtics have sent the two remaining leftovers from their 2008 NBA Finals-winning “Big Three” to Brooklyn. Kevin Garnett and Paul Pierce will go to the Nets in exchange for Gerald Wallace, Kris Humphries, Kris Joseph, Reggie Evans, and a signed-and-traded Keith Bogans. Jason Terry will also head to the Nets, who will also send Boston about as many first round picks as it legally can – the team’s 2014, 2016, and 2018 first rounders, along with the right for Boston to switch 2017 first rounders if Brooklyn’s pick is higher. On the surface, this seems like your typical fire sale return, even given the status of KG and Pierce. A deeper look reveals something more troubling for Boston fans. It’s understandable that Boston wanted to engage a rebuilding process, as the team wasn’t exactly threatening to be an Eastern powerhouse even before Rajon Rondo’s ACL tear in March. Garnett and Pierce had various contract options, though, that allowed for one last go of things next year under a brand new coach, or a chance to buy out and waive Pierce on Friday and Garnett the next summer. Neither would be ideal, because Garnett would be the wolf left amongst the veterans, playing for a team that probably wouldn’t make the playoffs. Teams don’t rebuild with this sort of payroll, though. The Celtics will still be way over the cap next season, and the team enter the 2014 offseason right at the salary cap level due to Wallace’s massive deal (three years, and $33 million after 2012-13), with restricted free agent Avery Bradley ready to hit a market that will have scads of teams working with cap space, and several roster spots left to fill. Real cap relief, the hallmark for any rebuilding team, won’t really set in until the 2015 offseason. And that’s when Rajon Rondo, sick of it all, could flee as a free agent. 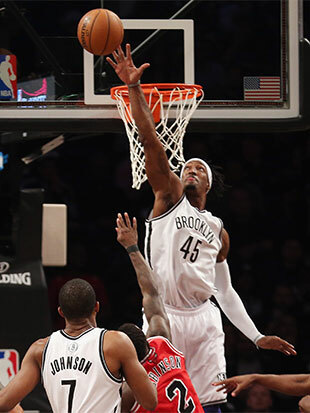 By the way, Gerald Wallace will still be on the books (two full years after the Chicago Bulls basically ignored him on offense during Brooklyn’s first round loss earlier this year) for over $10.1 million. The reward for all this cash, and all this patience? Most likely four of the Nets’ upcoming five first round picks. Is that worth it? I understand that Garnett only had a few teams he would propose waiving his no-trade clause for, to say nothing of the massive salaries KG ($11.5) and Pierce ($16.7) are set to make next season, but was this the best Danny Ainge could do? It’s not even a deal that was only NBA-legal on NBA draft night, either, as the deal can’t formerly be announced until July 10. There were no timely stipulations, outside of a mutual insistence on getting it done, that forced the teams to agree to it on June 27. It’s not all that great for the Nets, either. Or, more specifically, the outlook isn’t all that bright despite all these famous players that you’ve heard a lot about. They’re way over the luxury tax line, which means the team isn’t allowed by the NBA to compete with other franchises for players looking to play for salary cap exceptions, and they can’t engineer sign and trade deals to add depth while dealing out one of their massively compensated players. Pierce’s contract may run out after next season, but Garnett stipulated that he’d only waive his no-trade clause if the Nets guaranteed to pick up the team option on his contract for 2014-15. All while Joe Johnson, Deron Williams, and Brook Lopez alone make over a combined $201 million between now and 2017. This is it, for Brooklyn. A first round team from 2013 (losing to the Nate Robinson-led Chicago Bulls, at home in a Game 7) that is bolstering its attack by adding two of the three best players from another first round team. It’s also hard to call this a “bad” trade for the Nets, because they’ll definitely improve, they weren’t getting out of their salary cap hell anyway, and it’s not our money they’re spending. Still, if guard C.J. Watson opts out of his deal, the Nets will be on the book for nearly $97 million in payroll next year (with $80 million in luxury tax bills on top of that), with only nine players on the roster, and that includes two players (Tornike Shengailia, and Tyshawn Taylor) that you’ve never heard of. I understand the limitations for both teams. Pierce’s status as an all-timer, Garnett’s no-trade clause, Doc Rivers’ unhappiness and eventual leave, and the relative limitation of last year’s version of Boston’s supporting cast all led to a combustible mix. And the Nets weren’t going to be able to change things this summer, because while Brooklyn basically signed off on adding any cheap help through the first round of the draft for four of the next five years (while adding more highly-compensated help), they’ve always been attempting to win now. Even with a new coach in Jason Kidd that hasn’t coached a game in his life. This deal has to wait until July 10, though, which means it could have happened (after Boston picked up Pierce’s contract) at any point in the summer. Couldn’t Boston have gotten more? Couldn’t they have found their way toward a swifter, less drawn-out rebuilding process? Danny Ainge made his initial hay by finding great players with middling draft picks in the years prior to the debut of the Big Three. He’ll be stuck with the same task for the next few years, while his owners write checks for teams that will be both difficult to watch, and difficult to win with. It’s an unfortunate start to something we’ve known would eventual come someday, since that fateful day (after day) in 2007 that saw the Boston Celtics bring Kevin Garnett to town.